We're always happy to help and have provided this guide to enable you to quickly and effectively find answers, solutions and all the information you seek. This site contains over 1000 pages dedicated to providing you comprehensive information regarding the design, selection, installation, cleaning and maintenance of natural stone and most other countertop and flooring materials. that the information and answers you seek already exist on the site... it's only a matter of finding it quickly using the options below. In the box below simply type in the words, phrases or a brief description of the information you'd like, click the "search" button and a list of all pages addressing that topic will pop up. This option casts the widest net and will return the greatest number and variety of pages, information and answers. You'll find a search box at the top right and bottom center of every page on our site. Use any of these to quickly find what you seek from any page. Just click the appropriate link and you'll be re-directed to a page listing answers and solutions to common issues on the specific topic chosen. Looking for the the most comprehensive, focused and detailed information along with proven, low-cost, DIY, step-by-step, "how to" solutions to all types of problems....? Then download to your computer one of our Granite & Marble Maintenance and Repair e-books. These e-books will provide you the best and most complete answer possible. The type of stone or surface (granite, marble, quartz) IS very important, however, what is true for granite is essentially true for all colors/names of granite. What is true for marble is true for all marble, travertine, limestone, quartz, etc. The particular color or name of the same material type rarely changes the necessary maintenance, procedure or solution already available on this site. We are always happy to help! Thus, we have developed this page and above options so we can spend our time, effort and energy expanding the site to provide you with more and more unique information that will always be readily available and easy to access. However, if after utilizing the above options you're unable to find an adequate information, then please submit your question. We'll gladly answer it! Looking for care & cleaning products? 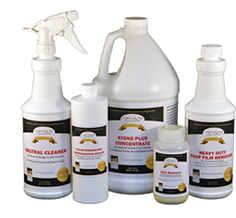 Visit our Stone Care Center to learn about and order recommended products. We truly appreciate you taking the time to visit us, hope you enjoyed our site and found the information and help you were looking for! Your thoughts and suggestions are certainly important and helpful, so if you have any comments or feedback regarding site function and/or interaction with our company, please click here to Contact Us and let us know what you think.